This twenty-year marriage had a happy ending: divorce. It’s not what you think, completely. Yes, the divorce was the right thing to do and we all felt better afterwards, or we would not have made that difficult decision. But despite the many years of struggle and anguish, Dave and I had a good marriage. Let me explain. I should start by saying that Dave and I had what is probably a typical marriage. Like most couples we were attracted to each other and fell in love because of our unidentified and unmet emotional needs. We felt “complete” with each other because our partner reflected a chance to heal our emotional shortcomings. Trouble begins when the euphoria wears away and you’re left primarily with the challenge of actually healing yourself. The opportunity that is marriage is that it provides the laboratory, lab partner and the incentive to avoid an “F” to discover and heal those unmet needs. That makes perfect sense in the somewhat sterile world of the blogosphere, but in the heat of the moment, after all your hot buttons get pushed, it is extraordinarily difficult to access the objective and responsible viewpoint. Which brings me back to my dear ex and dysfunctional marriage. Without my marriage, I would not have had the opportunity for self-discovery and improvement that my committed husband provided. I had a place and a partner who supported our individual and dual journeys for self-actualization for twenty whole years. My partner put as much time and effort into his personal journey as I did mine, and in so doing, helped me along my way. My ex helped me lift my head from my self-delusional sand to realize that it’s not only OK to imperfect, but it’s a condition that is conducive and even necessary for personal growth. No, the marriage did not work out despite our best efforts. Sometimes it got ugly. But I can proudly say that we both gave it our best shot and I believe I can speak for us both when I say we are both better people now than before we met. I feel sure our mutual commitment to each other until the very end is the reason we still fondly support and care for each other and that we have parted with little or no bitterness. I am still proud of Dave and his journey, and wish him much happiness and growth on his next big adventure. I know I am ready for mine. There are certain people that have brought out the worst in me. After many years, I believe I now have a much healthier approach to dealing with such difficult people and the conflict-ridden relationships that seem to inevitably accompany them. For me, first I had to learn to deal with the difficult people that were closest to me. In either case, whether in a close or casual relationship, difficult people do not do what I want them to do – either in their actions, their words or their attitudes. Behavior that really pushes my buttons are cruelty, hypocrisy, disrespect, treating others unfairly or narcissism, a list that may differ from yours. To make matters worse, when these difficult folks are close to you, such behavior has a much larger impact on how you feel, what you think, and the choices you make; therefore, being objective is all the more difficult, and their behavior all the more trying. Ironically, the answer for me crystallized when I looked at myself for my role in the unhappy dynamic. In other words, until I had taken ownership of my role in the conflict, I was going to be forever stuck in blaming someone else and unable to improve. Granted, this was a difficult step, but was critical for me to make any positive change. My big mistake in the dysfunctional dance? Having unrealistic expectations. My role, thus my responsibility. They were not the “difficult people”, I was the difficult person – and the common denominator. I was a perfectionist, i.e. I had ridiculously high standards for myself, meaning that I was not accepting myself and my imperfect humanity. My subconscious belief was that if I was not always smart, talented, cute, right, then I just wouldn’t be safe, accepted, loved, or approved of. I had to realize, finally, that perfection is not a virtue, it’s a cruel illusion that fosters lack of both authenticity and opportunity for improvement. Importantly, I had to forgive myself for being, well, human. Imperfect. Ripe for growth and development. “Forgiveness is a gift you give yourself” (Suzanne Somers) is really true, and the benefits of self-forgiveness are vast, pervasive and unexpected. Forgiveness of myself for being imperfect also allowed me to forgive others for their humanity and all the times they have disappointed me. Since I have learned to forgive myself for being insensitive, ignorant, selfish, undiplomatic, not loving, argumentative, defensive, I was able to forgive my loved ones for when they were being overly sensitive, know-it-all, demanding, needy, judgmental, hypocritical and critical. I was able to forgive them, since I had already forgiven myself. Finally, a wise friend (ok, it was my therapist) once told me that I may never have the relationship I want with my loved ones. Wow, that was an epiphany: accepting the person and relationship as it is. In other words, I should release my expectations, not only of myself and my loved ones, but of the relationship too. The lesson of 9/11 also reinforced this notion that control is an illusion. The more we invest in illusions such as control or perfection, the more frustrated, angry, resentful, and exhausted we become when we fail to meet expectation. I’m never going to be perfect, my loved ones will never be perfect, and it’s OK if our relationship is just – OK. Paradoxically the relationship improves when I don’t expect too much of it or my loved one. Therefore, in the end, I was the source of my own dissatisfaction. I was the difficult person. The problem was my lack of forgiveness, my failure to accept the reality of what was possible or even desirable for myself, others, or my relationships, and my insistence that it was someone else’s responsibility to fix the conflict and my own frustration. I was the only person I could change and I did not have to continue employing an unforgiving, judgmental, and blaming lens to view myself or my relationships. Accepting and forgiving myself and others for what is, rather than what should be, was a relief to my loved ones, but a transformative and loving gift to myself. There’s a good reason that depression skyrockets around the holiday, and I have to surmise that for a large number of people it’s because of difficult family relationships and dynamics. I would say our family dynamic is more… unconventional. Thanksgiving this year will mean a potluck dinner at my house with my kids, my sweetheart Chris, his daughter and her boyfriend, my ex-husband Dave and his parents and sweetheart. If we can only add in the parents of our sweethearts, this blended family stew (powderkeg?) would be like some sadistic Brady family gathering. The family reunion has been happening for special events and holidays for over two years, since Dave and my separation. This arrangement was suggested by our co-parenting mediator, that we do the holidays as a family, for at least a year. Dave and I happily did so, because we were acting on the belief that the kids’ needs came first in the divorce. After the year ended, it seemed to make sense to keep up the tradition. After all, it was nice to get together; Dave and I have very little animosity towards each other, and much good will after our 20 year marriage. I think it’s safe to say we both still enjoy each other’s company, at least the majority of the time, and that there is still much mutual respect and admiration, especially as to how it relates to each others’ role as parents. Last year it was a little different. Dave and I had both been in long-term relationships, and it felt wrong to exclude our new significant others from the table. How can we be properly thankful when we are leaving some of our dearest behind, like some kind of dirty secret? I can’t say it was the most relaxing, laid-back holiday we’ve ever head. I can’t say either that both Dave and I were on our best behavior the entire meal. My Chinese horoscope is the dragon, after all. But at least we broke the traditional social expectations of going to our separate corners/tables and tried, for the most part successfully, to keep our divided family united. Therefore, this Thanksgiving, I am extraordinarily grateful to those that love us enough to share in our crazy effort to stay together. I’m not sure if it’s hardest for our sweethearts or the in-laws, but it’s obvious they love us enough to support our efforts and idealism. Most of all, I’m enormously thankful for my family who is demonstrating with their actions that love is unconditional and a divorce decree does not mean you have to break your vows of loving someone forever. This one might be a hard one for some of you to understand. Sometimes it’s hard for me to understand as well. But I’m mourning the end of my son’s high school volleyball season. No he hasn’t played all his life. No he isn’t the best vb player in the state, much less the district. No I don’t play myself, nor am I some vb fanatic. But between our two sons, we have been eating, drinking, and living volleyball for the last 5 years and it has been a wonderful, joyous ride that has abruptly ended. Our younger son is a senior and the season is over. 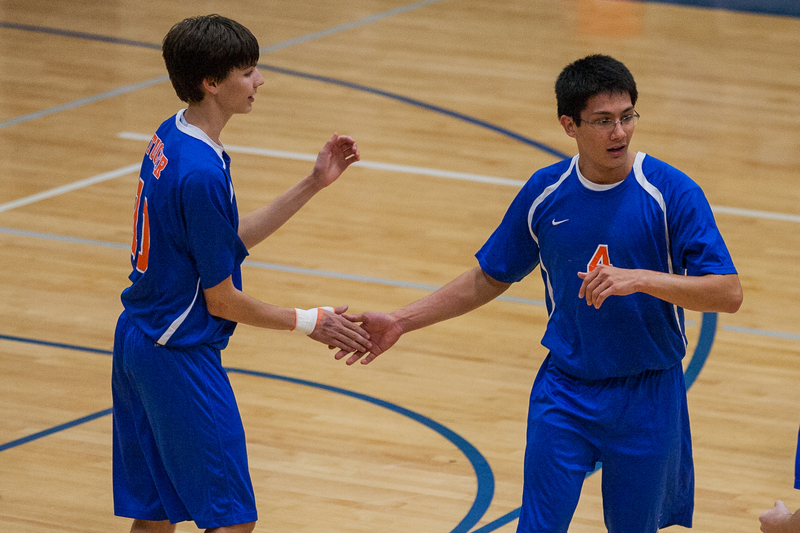 Vb has been a place where both my boys have found a passion and have used it to find personal excellence. Both have taken natural athleticism and have optimized their play using their individual talent set. Jackson, our oldest son, was able to use his strategic thinking to maximize his efficacy, finding the best spot on the court to hit for best effect, or knowing when to hit hard or just tap it over. Our younger son, Simon was able to develop and improve his strength and athletic ability to improve the speed and vertical of his attack. Simon has always had the ability to make flying through the air look effortless and graceful, and this has only improved with time and hard work. His ability to improvise on the court and make a micro-second shift from hitting in the middle to outside position within a single play has always astounded me (non-vbophiles: usually players play one position the entire game despite the rotation). Vb has also allowed each boy to discover and develop his individual leadership style. Jackson has always been more like me, a visible leader that enjoys developing relationships and does not mind being the central leader figure. He was a natural and effective leader on his high school team, assuming the team captain role starting his first year. Simon, however, is the type of person you’d never expect to be leader. Quietly guiding, encouraging, role modeling, he has emerged as the prototypical humble servant leader almost completely under the radar. So it’s not that I’m some adrenaline junkie looking for that rush that comes with a beautiful “kill” or block, but the loss of vb means losing the boys’ platform for personal development, an outlet for the passion, an escape from the real world where sometimes the impossible happens. But this blog is about finding positivity, optimism and gratitude, not mourning the end of an era. I have to admit I am a naturally optimistic person but sometimes it is harder for me to find the silver lining in a situation. I lay awake in the wee hours of the morning contemplating where the silver lining is for this loss. I admit I had to fall to an old, tried-but-true standby: when one door closes, another opens. In this case, not only the boys but the whole family has an opportunity to do something new and fresh with the time, energy and money that is now available in abundance. Jackson went to college and is relentlessly pursuing his interests in leadership, governance, and taking advantage of social opportunities in quantity that only undergraduates seem to be able to maintain. What will our young son do? Will he find a new sport? A new hobby? A new hairstyle? Will he find yet another vehicle to develop, mature and contribute to society? I can’t wait to find out.